Digital cinematography enables (and sometimes even requires) post-production related activities to be taking place already on the film set. If you think about data backup of camera footage, dealing with “log” signals, or even transcoding dailies on set, all these things have become quite common to do on set – although all of these activities were formerly handled in post production locations. In this article we want to focus on such an activity: The interactive work with the digital look of camera images on set, also known as “live grading”. This activity is becoming increasingly popular for productions to do on set, while some don’t do it at all. So why would a production choose to do live grading? In the following we will point out four immediate benefits, and show how they can affect your next project. In pre-production a lot of time and work is spent on preparing “the look” of the production – e.g. by collecting reference material and creating extensive mood boards. The outcome of this preparation is used as a starting point and guideline for the thousands of little decisions made during the actual production. One part of the outcome that is relevant for the camera department is the camera look, also referred to as the show LUT. This show LUT is a digital look transform that includes creative color grading adjustments such as specific saturation, or contrast changes. This LUT (or maybe a hand full of different ones) is created by a colorist and/or by the DP directly. Besides other elements that also influence the look (such as set, costume, lighting etc.) show LUTs are very often created and used as a static starting point for camera monitoring on set. The show LUT is only used for monitoring the live signal – the camera will always still record a neutral or RAW image in order to have maximum quality and flexibility in post-production. the digital look applied to the camera signal. These four factors heavily influence each other, so often a bit of interactive work is needed to “get it right”. 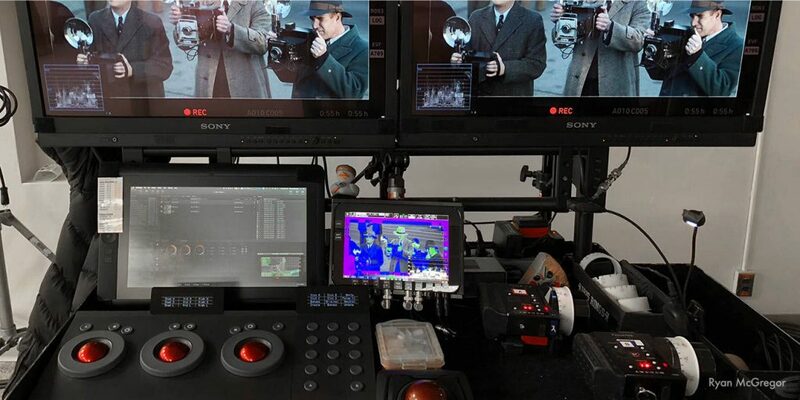 A prepared digital look is usually applied to the camera signal, so that the DP’s (and the DIT’s) monitor shows the camera signal through the show LUT. This makes it easier to judge how changes e.g. in lighting or exposure influence the contrast of the resulting image under a chosen LUT. But the same way you sometimes decide to change lens for a certain reason, the show LUT may not work properly in the given conditions. Being able to tweak the look (e.g. by reducing the contrast or making the appearance a bit warmer) helps the DP to achieve and stay within the creative intent. In some cases the show LUT is not prepared before production, but is developed during the first few shooting days under the guidance and input of the DP’s creative intent. Being able to “live grade” on set allows to create a look based on the current scene. This way a look can either be developed from scratch (e.g. based on the manufacturer-provided standard look transforms for the chosen camera system), or a prepared look can be developed into something better and more suited than what may have been possible in pre-production. It is quite common that different camera and lens models are used within one production. There are good reasons to do that, but the downside is that changing camera systems and lens models influence the look of the image. In order to maintain a consistent look for the entire production, it is necessary to compensate for these differences. The easiest way to do so is to adjust the digital look. Not only the different equipment can alter the look in unintended ways, but also the scene context (e.g. different lighting, framing, or just changing the focal length). Consistency can already be a challenge with one camera, but it gets even more obvious when using multiple, potentially different cameras, or working with multiple units. The easiest way of preserving a consistent look is by comparing the current camera signal to reference frames that are shared from earlier shots. With the reference image visible, it’s sometimes only a slight modification to the digital look that is needed to preserve a consistent look. When a consistent look is maintained throughout the entire shoot, that’s the best starting point for creating dailies for viewing and proxy files for editing. When shots are edited, each “jump” in the look appearance from one clip to another makes it harder for the editor to create the effect of a fluent scene. The camera’s live output is designed to match the appearance of the recorded footage, so the look that worked on the live signal can also be directly applied to the recorded footage with the same result. In practice the DIT saves look metadata for each of the look manipulations and adjustments done during the shooting day. This look metadata is then matched to the recorded clips in the dailies creation software. This way the dailies and proxies will look exactly the same as the live signal on the HD-SDI monitor on set. When the proxy files with the look applied are watched in editorial, this ensures the creative intent of the DP is considered in post production. In addition to the dailies and proxies use case, the look metadata can also come in very handy during the post production activities VFX and final color correction. The VFX department for example can use the look metadata to simulate the look of the DP’s monitor in the facility. Being able to view not only the camera source material, but also the visual effects through that look improves how well the visual effects will match the overall look of the production. For a colorist the look metadata can act as a starting point for the final color correction and as a good reference for understanding the original intent on set. All this helps to improve the overall quality and consistency in post production. The activity of adjusting the digital look on set can have different forms. When the DP wishes to interact with a DIT about live grading, live grading will play a more prominent role close to the DP’s or DIT’s monitors. Even if the DP doesn’t operate color controls in most cases, she gives the creative input. The DIT on the other hand runs and operates the live grading system, and also provides reference frames at the DIT cart for maintaining consistency. Sometimes live grading is not requested by the DP and is not part of the interaction between DP and DIT. Nonetheless it can still be valuable for the DIT to maintain a small live grading setup – especially if dailies and proxies should already be created on set. With such a smaller setup the DIT can adjust a prepared look to the scene context during shooting. The moment the camera card arrives, preparation of look metadata is already done, and the looks can be applied directly to the camera’s source footage. This allows to create dailies and proxies with a consistent look directly after shooting without any further adjustments. If you’re concerned about the look of the image, live grading is a way to improve the production quality – by supporting the DP’s work with the camera, the creation of graded dailies and proxies, and for ensuring a consistent look in the entire post production. Loading a LUT or look into the camera is the first step of working with looks on set, but being able to adjust the look to the specific needs of a scene or setup adds a lot to the quality of the entire production.